2. Brush chicken with oil and season. 3. Cut vegetables and place them in a roasting pan. Place chicken on top of vegetables. 4. Place in oven and roast for 1.5-2 hours. 5. 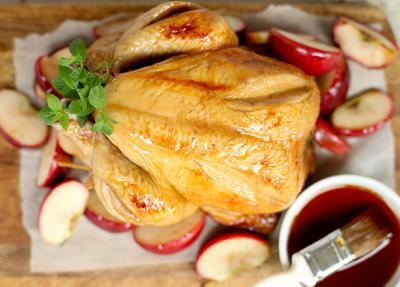 Baste chicken every half hour with Apple syrup. 30 minutes before it’s ready, spread apple pieces around chicken. 6. Remove from oven and let stand 5 minutes before slicing. 7. During this time, retrieve cooking juices and mix with Apple syrup. 8. Serve with cooked apples, celeriac mash and sauce. 1. In a non-stick pan, melt butter. Sweat shallot for 2 – 3 minutes. Deglaze with cider. Add syrup and pour in veal stock. Reduce until desired consistency. • For a softer, creamier texture, add a bit of 35% cream to the sauce. • TIP: For crispier skin, separate the chicken skin from the breast meat by carefully sliding your fingers in between. Spread butter under the skin and cook as explained above. • Flavour your butter with Apple syrup (see turkey recipe), lemon zest, sundried tomatoes, honey, tarragon, minced garlic, etc.